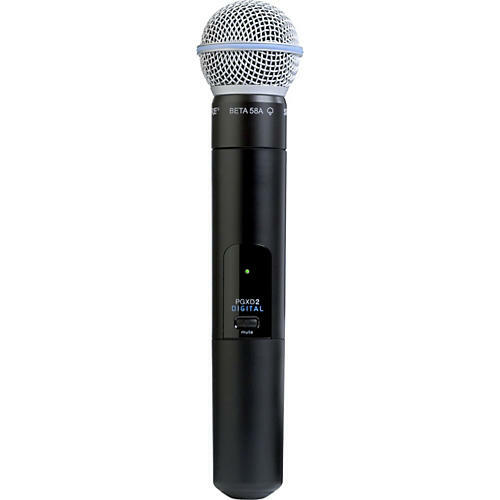 The PGXD2/Beta 58A Handheld Transmitter with SM86 Mic is designed for use with Shure's PGXD Digital Wireless System. The PGXD2 transmitter features automatic setup, a multifunction LED Indicator (power, lockout, mute, low battery), and provides you with 8 hours of continuous use on 2 AA batteries. It gives you and your microphone a generous 200' (60m) operating range without losing audio quality. Besides the Beta 58A microphone and PGXD2 handheld transmitter, you also get a padded carrying case and a microphone clip.